Winnie the Pooh has Canadian and World War I Link. So remember our post about Winnie the pooh where I mentioned how it has Canadian Links well now here is a strange twist. The real bear who was donated to London zoo actually was donated by a World War I Soldier “Harry Colebourn”. He originally bought the bear for $20 dollars and gave him the name “Winnie” for his hometown Winnipeg. Winnie so he can feel closer to home on battle ground. 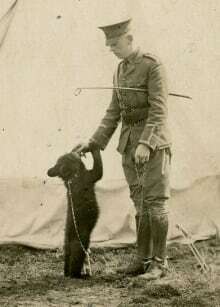 The bear remained with him during the war and served as mascot of the regiment. He was donated afterward to London zoo. Here are some more Interesting Canadian Inventions and Contribution to the World.